ICISTS-KAIST, the largest and most prestigious International Conference in Asia, would like to once again welcome you this summer. Q) What will the delegates do at ICISTS-KAIST 2009? We invite numerous great professionals from various fields of expertise. Last summer, we had the pleasure of welcoming Michael Pollitt, a twenty-seven-year-old CEO of the Shadow Robot Company; Steven Dubowsky, a professor at MIT; and Jim Dator, Director of the Hawaii Future Research Center, famous for being a futurist as well as being the partner of Alvin Toffler. You may look forward to meeting other great lecturers at ICISTS-KAIST 2009! You will have gained an insightful opinion after having several in-depth discussions involving science and technology. The topics are carefully chosen from current science issues that have significant impact on our society. We guarantee that you will have broadened your view of the issues after the conference. At ICISTS-KAIST 2009, you will interact with students from almost 30 different countries, as well as Korean students from top universities in Korea, to form a world-wide human network. Social events include the Gala Night, the closing ceremony of ICISTS-KAIST when all delegates celebrate the end of our 4-day program. All delegates of the conference will share special memories and keep in touch even long after the close of the conference. 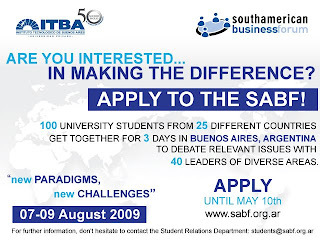 The registration period for the fifth edition of the SABF has already opened, and we would like to invite all students to participate in this experience, unique in South America. The event will take place on August 7th, 8th and 9th in Buenos Aires, Argentina, and is aimed at all undergraduate university students born in or after 1979, or students who graduated in 2008 or 2009. The main topic of the 2009 SABF, "New Paradigms, New Challenges", pretends to analyze the many issues on a social, environmental and economic level which have arisen in the last few years, and are questioning the functioning and viability of our current global system. These different tendencies are altering the existing paradigms, and they will be the main topics of discussion during the forum. To apply, students must enter the Register section of our website. There, they must complete their personal information and load an essay of their authorship about one of the following three subtopics, which are related to the main topic: "Education & collaboration: a new approach to development", "Environment and sustainability: from discussion to action" and "Opportunities in a changing economy". Barack Obama was inaugurated as America’s 44th president, becoming the first black man to hold the office. With the country in recession, Mr Obama delivered a sombre speech from the steps of the Capitol building to a throng of people on the National Mall. The White House proclaimed it “a national day of renewal and reconciliation”. The Obama victory is about more than Obama, and about more than black and white. In a democratic republic like the U.S., the president is both a maker and a mirror of the manners and morals of the electorate that has invested him with ultimate authority. Will the journey be smooth? That is doubtful. Politics can quickly turn mean. In hard economic times there is often a search for an "other" on which to blame the problems of life. In the wake of a possible terrorist attack, fear could easily lead to tension, resentment and discord. The U.S. has a new president. But he, too, has a new nation to lead, one that's changing almost beyond recognition. While Arab, European and United Nations leaders have put their weight behind calls for a cease-fire in Gaza, the U.S. has blocked a Security Council statement to that effect. Blocking the Security Council statement appears to be among the farewell performances of the Bush administration (along with a recent ocean conservation plan). As the Obama crew comes in place, the balance in US foreign policy between the liberal approach of a democrat government (perhaps a change from the previous “unilateralism”) and the general “anti terrorism” position of recent years, is of observation worth. And there’s the eager Frenchman. France has kept a tradition of foreign policies which “stands out” from its fellow European countries, be it the constant contravention against US positions during the Cold War, or the hardheaded nuclear test in 1997. Since President Sarkozy came to office, we have seen the Frenchman’s active participation in international politics, as observed in the European summit in response to the current financial crisis, the EU conference on carbon emission, and of course the call for a cease fire on the present Gaza conflict. Again we may suggest that the tradition is being kept, in a rather dramatic manner. As to economic influences, the strength of the current global recession and the impact of the Middle East conflict can be regarded as two factors working against each other. Which of these factors has the greater effect on oil prices, and hence the world economy, might prove an interesting episode in midst of the credit crunch. PARIS — The secretary general of NATO had lunch on Friday with the Russian ambassador to the organization, beginning the “conditional and graduated re-engagement” with Moscow that NATO foreign ministers approved earlier this month. Russia has always taken NATO as an aggressive alliance, especially when the Czech Republic, Poland and Baltic countries became members of NATO. While the United States tried to bring Georgia and Ukraine into NATO, Russia finally made a move and gave a firm response with the Georgia War, condemned by the West afterward. However, a large part of European countries’ gas imports are from Russia. No one can promise the stability of gas sources since Russia once cut the pipeline to neighboring countries. If the European countries are in conflict with Russia, it will only threaten their energy supply and consequently their economy. While China, being more influential after the Olympics, actually gets the most benefits from the status quo. How to avoid a firm alliance between Russia and China in confrontation against the West might be the latter’s priority challenge. It seems the big nations have no choice but to gradually re-engage with Russia as a new rising power. Hope the re-engagement is as good as the lunch. These posts are meant to make some (casual) comments on recent international events. They are NOT meant to fulfill any academic criteria or purpose, except being generated through some (definitely not so thorough) knowledge of international relations. Personal opinions and feelings of the author(s) can be found in the paragraphs, and everyone, especially applicants and participants of the GIS conference are welcomed to share their views. Informal and casual. Open ended. United Nations Secretary-General Ban Ki-moon Thursday urged the world to overcome economic and political concerns to work out a "Green New Deal" to cope with climate change, while incoming U.S. President-elect Barack Obama's representative to talks in Poland, Sen. John Kerry, D-Mass., urged China -- now the world's top greenhouse gas emitter -- to commit to large-scale emissions cuts. Over the past couple of years, discussions have been emerging among many of the influential international figures and entities (UN, US, EU, etc.). With the Kyoto Protocol expiring in 2012, the buzz on reaching a new agreement on climate change/ green house gas emission has been the one of the core topics (and a “universal value”) on numerous events. Yet on this specific issue, we can again easily observe the realism of international politics. The quarrel between “developed” and “developing” nations have been shoving the “responsibility” of reducing emission to each other. Seriously, who gives a damn about polar bears when you have hungry (perhaps even angry and armed) people, international pressure and/or big time industries on your back? 80 participants will be selected through an essay competition. Applicants must be undergraduate or graduate students, and must not be born prior to the year 1974. All applicants must be registered to the GIS Taiwan 2009 website. Applicants' essays must be uploaded by 15th March, 2009 to be eligible for the competition. Global Initiatives Symposium in Taiwan (GIS Taiwan) is an international conference organized by university students in Taiwan. We hope to gather innovative ideas from fellow students around the world to address current issues faced by the international community.